This Saturday February 20, 2016, at 3 p.m. EST, Hope will be playing at Calvin, and fans will gather all over the country to celebrate one of the greatest rivalries in college basketball! We are excited to invite everyone to come and cheer on the Flying Dutchmen of Hope College OR the Knights of Calvin College this weekend. Parents, alumni, and their families are all welcome at Osgood Brewing, a family-friendly microbrewery and restaurant in old downtown Grandville. We offer a selection of beer, wine, cider, soft drinks, and a full menu including kids' options! The game will be on the TVs, we will have giveaways and drawings (free to participate). We are also having a special fundraiser for Hope Alumnus and former basketball player Chris VanderSlice ('99), the principal at Grandville High School, who is in the midst of a difficult battle with cancer. As part of the Hope Family (owner Mindy Denning is an alumna), we want to reach out with our support, and felt this was a great opportunity to make a difference for their family! Upcoming: Vintage & Blueberry Fest! Last year this event was a huge event in Downtown Grandville! We're excited to see it becoming an annual thing, and can't wait to see everyone on Chicago Drive (the road will be closed to traffic). We'll have a beer tent outside, as well as some special food and beverage offerings at Osgood you do not want to miss! On a beautiful summer afternoon, what beats sitting outside sipping drinks with your friends? That sounds pretty perfect to us! So, we have some exciting news! An outdoor seating area at Osgood Brewing has been dreamed of and designed, and we are kicking off this project with a patio brick sale! We want to give our community members, craft beer enthusiasts, family, and friends the opportunity to be a permanent part of this construction. By purchasing a brick for you, your family, or your organization, you can show your support and help make this happen! So, share this post, share the link on Facebook, whatever you can do (we appreciate the social media shares and support so much)! We are going to do our best to spread the word, but we don't want anyone to miss out on this news and this chance. If you decide to buy a brick, your purchase will be managed securely by Brickmarkers, and we will receive the engraved bricks from them when we are ready to install! We have two brick sizes available: 4x8 and 8x8. If you do not wish to purchase a brick, there is also a place to simply donate any dollar amount if you still wish to help out! Our goal is to have the patio open this summer, so please show your support! We want our community, our guests, and our friends to be a part of what we are creating. 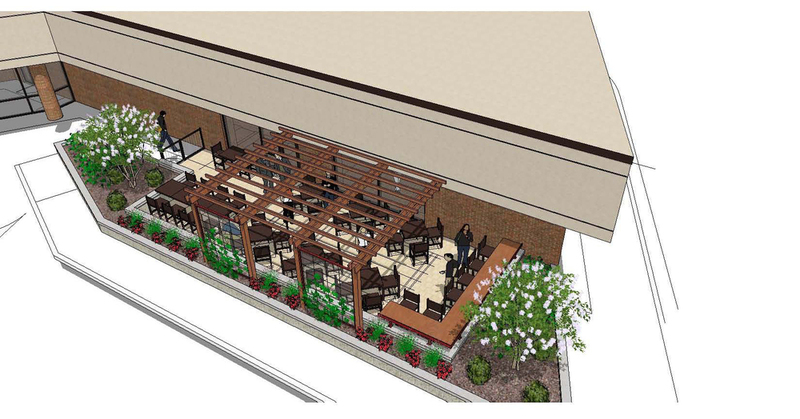 This patio will be a fantastic addition to the redeveloped and thriving historic downtown Grandville area! Our patio will include seating for around 40 guests, accessible from a new doorway on the west side of our brewery / restaurant. 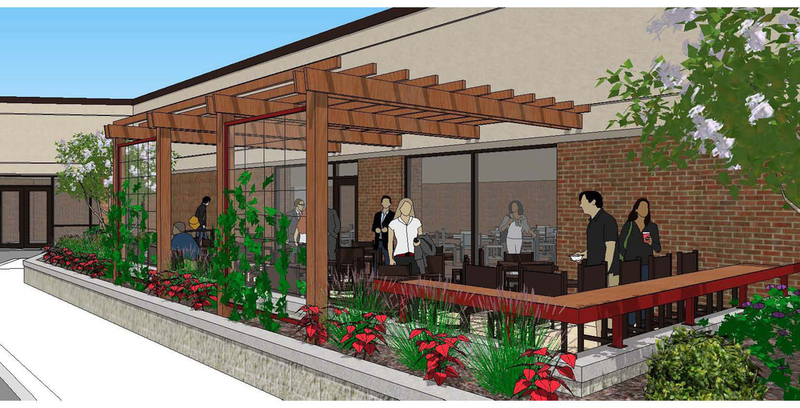 The patio will feature an overhead trellis, a retaining wall, a bar height counter facing Chicago Drive, and landscaped surroundings. Interested in joining the team at Osgood Brewing? We are looking for friendly, energetic, hard working individuals to fill the following positions: Cook, Server. Job descriptions are listed below. If interested, please fill out the attached job application, and either drop it off at the brewery, or mail it to us. Regularly required to talk or hear. We opened the doors one year ago, and what a year it has been! We thank you all for your support, and are excited to celebrate our first anniversary! Please come out on Friday, September 5, 2014. We will be tapping two firkins (grapefruit porter, and chocolate coffee chipotle stout), there will be new beers on tap, a beer tent out front, and live music all night (Nidal, Karisa Wilson, and Five Minutes Tardy). We hope to see you there! It's going to be a great night! We are open all day (regular business hours), but festivities begin at 5PM!